PJAE covers the applied research areas like agriculture, credit, finance, savings and investment, economic policies, education, health and nutrition, industry, manpower and employment, monetary and fiscal, population, rural and urban development, trade and aid, environment, transport and communication, water and power, etc. Papers with empirical work are preferred, which is helpful for policy making issues on the Third World Countries. The target group of readers is economists in academia, research institutions, government, etc., both local and international. A free online access and free publication make it easily available. 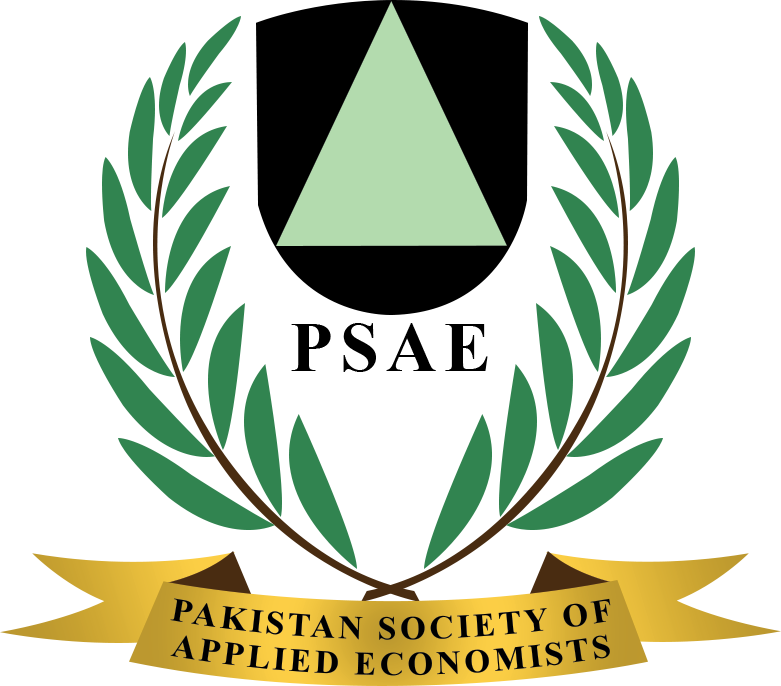 Pakistan Journal of Applied Economics since its inception in 1982, aims to provide its readers a unique forum for the exchange and sharing of information in the complex area of economics. The journal presents the social-economic problems, as expressed by economists, philosophers, political scientists, historians and business academics. The Journal publishes original contributions on applied issues in micro and macroeconomics. The primary criteria for selecting papers is quality and importance for the field. Papers based on a well motivated research problem that make a concrete contribution to empirical economics or applied theory are especially encouraged. It particularly fosters quantitative studies, the results of which are of use in the practical field, and thus helps to bring economic theory nearer to reality. 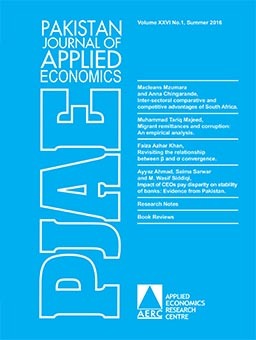 All copyright of the content of Pakistan Journal of Applied Economics (PJAE) are with the Applied Economics Research Centre (AERC), University of Karachi. Submission of a paper will be held to imly that it contains original unpublished work and is not being submitted for publication elsewhere. The Editor does not accept responsibility for damages or loss of papers submitted. Manuscript should be typed in MS Word, double spaced, and hard copy with wide margins on one side of the page only. Common symbols in equations should be used; and unless necessary, the use of separate clips in manuscript should be avoided. All pages should be numbered consecutively. Titles and subtitles should be short. References, footnotes, tables and legends for figures should be typed on separate pages. The legends and titles on tables and figures must be in MS word (Times New Roman font), sufficiently descriptive such that they are understandable without reference to the text. Colours of axes, bars, boxes, etc., used in figures should be visible when printed in black colour. The dimensions of figures axes and the body of tables must be clearly labelled in English. The first page of the manuscript should contain the following information: (i) the title, (ii) the name(s) and institutional affiliation(s), (iii) an abstract of not more than 100 words. A footnote on the same sheet should give the name and present address of the author to whom reprints should be mailed. Acknowledgments and information on grants received can be given before the References or in a first footnote, which should not be included in the consecutive numbering of footnotes. Important formulae (displayed) should be numbered consecutively throughout the manuscript as (1), (2), etc., on the right-hand side of the page. Where the derivation of formulae has been abbreviated, it is of great help to referees if the full derivation can be presented on a separate sheet (not to be published). Footnotes should be kept to a minimum and be numbered consecutively throughout the text with superscripts arabic numerals. Ahmad, Jaleel, 1978, Import substitution, trade and development, Amsterdam: North-Holland, 3-40. Newbery, David M.G., 1975, The choice of rental contract in peasant agriculture, in: Reynolds, ed., Agriculture in development theory, New Haven: Yale University Press. Baumol, W.J., 1982, Applied fairness theory and rational policy, American Economic Review, 72(4): 639-651. Illustrations should be provided in triplicate (1 original drawn in black ink on white paper + 2 photocopies). Care should be taken that lettering and symbols are of comparable size. The drawings should not be inserted in the text and should be marked on the back with figure numbers, title of paper and name of author. All graphs and diagrams should be referred to as figures and should be numbered consecutively in the text in arabic numerals. Graph paper should be ruled in blue and any grid lines to be shown should be inked black. Illustrations of insufficient quality which have to be redrawn by the publisher will be charged to the author. All unessential tables should be eliminated from the manuscript. Tables should be numbered consecutively in the text in arabic numbers and typed on separate sheets. Any manuscript which does not conform to the above instructions may be returned for necessary revision before publication. The Pakistan Journal of Applied Economics regular the process to report, assess, inquire into, and investigate statements of research misconduct at the AERC. The Main policy applies to all faculties, reviewers, researchers, students and staff engaged in the proposing, performing, reviewing or reporting of research. The AERC adopt their own procedures with respect to discipline as a result of an investigation committee finding of misconduct. If the Author is a faculty member, reviewer, researcher or students the report will be sent to the main, co-author of the paper, the Dean, and the Vice Chairman of the University and the author is blacklisted in PJAE. At first submitted manuscripts checked Plagiarism through the trunitin software, after that manuscripts are evaluated by ‘Internal Reviewers’ on the basis of the academic merit (importance, originality, study’s validity, clarity) and its relevance to the scope of Pakistan Journal of Applied Economics (PJAE). Editor, Editorial Committee members and the Publication staff will not disclose any information about a submitted manuscript to anyone. The editor of the PJAE ensures that all submitted manuscripts being considered for publication would undergo double blind peer-reviewed by experts in the field of the concerned paper. Editor is also responsible for deciding as to which of the manuscripts submitted to the journal will be published (after going through the routine process through the Editorial Committee), and based on validation of the work in question, its importance to researchers and readers, the reviewers’ comments, and such requirements as are currently in force regarding libel, copyright infringement and plagiarism. The editor may confer with the Editorial Committee of PJAE and other concerned academicians or reviewers in making decisions. Any invited referee who feels unqualified to review the research reported in a manuscript or know that its prompt review will be impossible, should immediately notify the editor and decline the invitation to review so that alternative reviewers can be contacted. Manuscripts received for publication should be confidential and must be treated such that they must not be knows or discussed with others, persons except the Editor (Ed. Committee, Ed. staff). This also applies to the invited reviewers and referees who decline the review the invitation. Reviews should be conducted objectively and opinions of reviewers should be formulated clearly with supporting arguments so that authors can use them for improving the manuscript. Reviewers and/or International (External) Referees should identify relevant published work that has not been cited by the authors. Any statement that is an observation, derivation or argument that has been reported in previous publications should be accompanied by the relevant citation in the text with year of publication. These references shall approve with author (s), year, title of the study/book and name of the journal book/report, exc., with volume issue No. and para. A reviewer and/or international referee should also notify any substantial similarity or overlap between the manuscript under consideration and any other manuscript (published or unpublished) of which they have personal knowledge. Any invited referee(s) who have conflicts of interest resulting whatever with any of the author(s), institutions connected to the manuscript and the work described therein should immediately notify (in writing) to the editor to decline the invitation to review so that alternative reviewers can be contacted. Unpublished material disclosed in a submitted manuscript must not be used in a reviewer’s own research (whether a reviewer of a paper or regretting to review the paper) without acknowledgement or written consent of the author(s) of that work. Privileged information or ideas obtained through peer review must be kept confidential and not to be used for the reviewer’s personal advantage. The authors’ names should be accurately reflected as to who carried out the research and who wrote the article, and the order of authorship should be jointly determined by all co-authors. Authors must ensure that their contribution does not contain any libel matter or infringe any copyright or other intellectual property rights or any other rights of any third party. Publications that have been influential in determining the nature of work reported in the manuscript should also be cited. Plagiarism is of many kinds, from ‘passing off’ another’s paper as the author’s own, copying or paraphrasing substantial parts of another’s work (without attribution), and claiming results of research conducted by others. Plagiarism in all its forms will be treated unethical behaviour and would be unacceptable. The authors should ensure that they have written entirely the original work, and if they have used the work and/or words of others; it should be appropriately cited or quoted. Authors should obtain permission to reproduce any content from the third-party/source (text and images). Third-party content for which permission has not been obtained (excluding contents by permission) should not be contained in the paper. No fee or charges would be changed from authors for manuscript processing in the PJAE. Authors pay neither submission nor publication fee. The PJAE is being regularly publish with the financial support of the Higher Education Commission Government of Pakistan. Authors should declare that the study/paper submitted to PJAE is original. Authors should ensure that their manuscript has neither been submitted nor published elsewhere (single/jointly). Sections of the manuscript which overlap with others/authors published or submitted content should be acknowledged and cited. If the PJAE receives complaint that any contribution to the Journal regarding Authorship, Plagiarism, duplicate, concurrent publication/Simultaneous submission, research results misappropriation, allegations of research errors and fraud or otherwise unlawful materials, PJAE will investigate the complaint. Investigation may include a request that the parties involved substantiate their claims. The Journal will make a good faith determination whether to remove the allegedly wrongful material. A decision not to remove the material should represent the Journal’s belief that the complaintis without sufficient foundation, or if well‐founded, that a legal defense or exemption may apply, such as fair use in the case of copyright infringement or truthfulness of a statement in the case of libel. Editor and the Editorial Committee will take responsibility to measures when ethical concerns are raised with regard to a submitted manuscript or published paper. Every reported act of unethical publishing behaviour will be looked into, even if it is discovered at author stage. If you have a complaint with our editorial or your subscription, please feel free to contact us at email pjae@aerc.edu.pk.